Andrew MacInnes, a planner with the New Orleans District of the U.S. Army Corps of Engineers, writes down ideas at a public input session on how to address sea-level rise and flood risk. 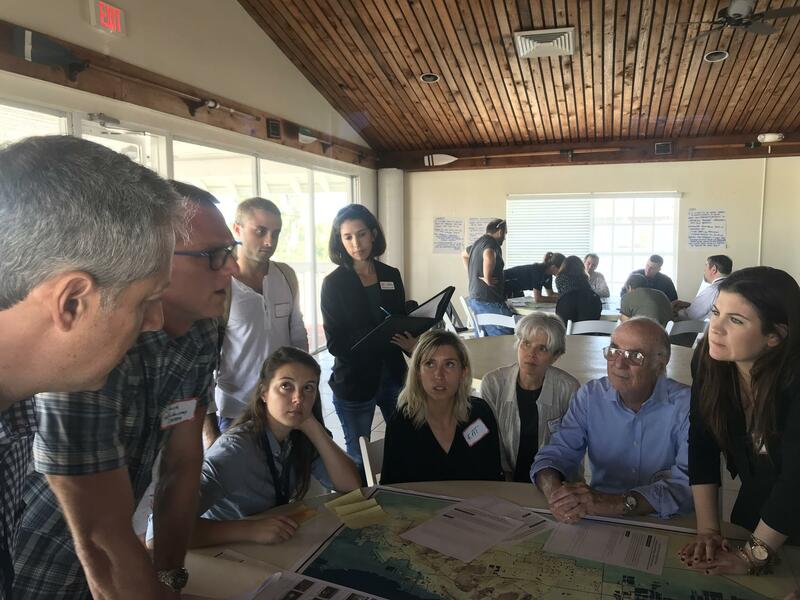 "We've got so many people here who are experts in their respective fields," said Andrew MacInnes, a planner from the Army Corps' New Orleans district, as he surveyed the room. "I’ve talked with people with the ports here in Miami and with city and county-level people. We’ve got folks from environmental organizations." Participants in Thursday's public input session came from universities, environmental groups, businesses and cities throughout Miami-Dade County. The Army Corps team leading the study is mostly from Norfolk, Virginia. MacInnes said while some flooding and sea-level rise challenges are the same across communities, others -- notably the porous limestone that allows seawater to seep up from underground -- are unique to South Florida. That's why, he said, the Corps wants to start the study by tapping into local expertise. Corps and county staff used markers to write down idea after idea on giant sheets of paper they hung on the walls. Also on the walls were images of different adaptation projects, from preserving wetlands and coral reefs to raising buildings and installing flood panels. People used stickers to vote for the ones they support. John Gulla is an emergency manager for the University of Miami’s campus on Virginia Key and a lifelong resident of south Miami-Dade. He said he thought the input session benefits "us, not only as a university, but also as a community here on the barrier islands, and then of course, in a larger sense, in South Florida in general." Gulla said ideas from his table included connecting barrier islands to potentially make them better buffers against storm surge. Organizers with Miami-Dade County said more than 120 people registered for the event. The Corps says future meetings on its study also will include opportunities for public input.